Gifts for the Angel Tree which has ARRIVED! Help local children experience the joy of the season and adopt an angel this year. For further information stop in the library. This program is managed by the Heyworth Community Club. December 2 at 3:20 p.m.
December 5 at 6:30 p.m. 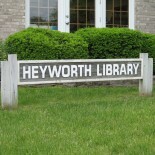 This entry was posted on November 22, 2016 by Heyworth Public Library District.